The MASCC/ISOO Annual Meeting is the foremost international and multidisciplinary conference on supportive cancer care. It covers the entire spectrum of problems experienced by patients as a result of their cancer, as well as their cancer treatment. The conference will feature engaging session formats, such as Educational Workshops spanning a range of topics, E-Poster Discussions of the latest research, and Plenary Sessions by world experts. Join us on 21-23 June 2019 in San Francisco, the centerpiece of the Bay Area and one of the most beautiful and progressive cities in the world. 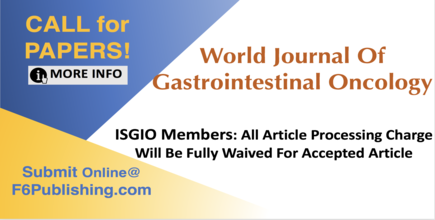 The World Journal of Gastrointestinal Oncology (WJGO) is a leading academic journal publishes latest, cutting-edge basic, translational and clinical research findings, that have impact in clinical practice in the field of GI oncology. Young investigators and fellows are strongly encouraged to showcase and index your paper in Web of Science, PubMed, PubMed Central, Scopus and MEDLINE. We welcome orginal article and review submissions.